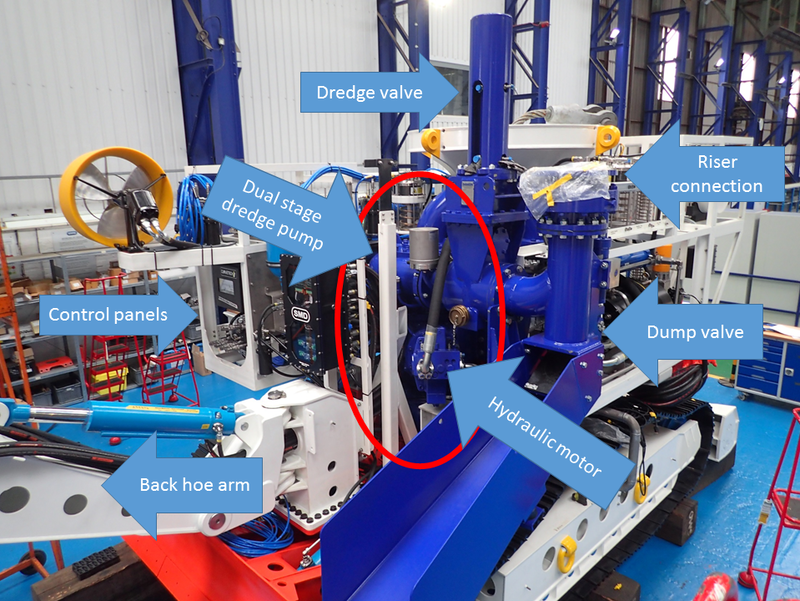 Dual Stage Dredge Pump and Double Action Pump Drive for ¡VAMOS! These days I have been very busy drafting a manuscript about our ¡VAMOS! project results1 for a dredging conference paper. As every writing process, there is so much to tell and so little space available. At a certain moment there follows a phase called: ‘kill your darlings’. You have to scrap parts that contribute less to the main message of the article. Still some of those orphans are worth sharing. So here is a part from the paper that might be interesting for you. For those unfamiliar with ¡VAMOS!, it is a Viable Alternative Mining Operating System2, where we are cooperating in a 17 partner consortium to develop equipment and procedures for exploiting mineral reserves in disused or currently unavailable mines in the EU3. Many mines are disused, but still contain some reserves, that are unrecoverable due to an uneconomic stripping ratio4. We developed a prototype mining vehicle (MV) and an accompanying launch and recovery vessel (LARV)5. 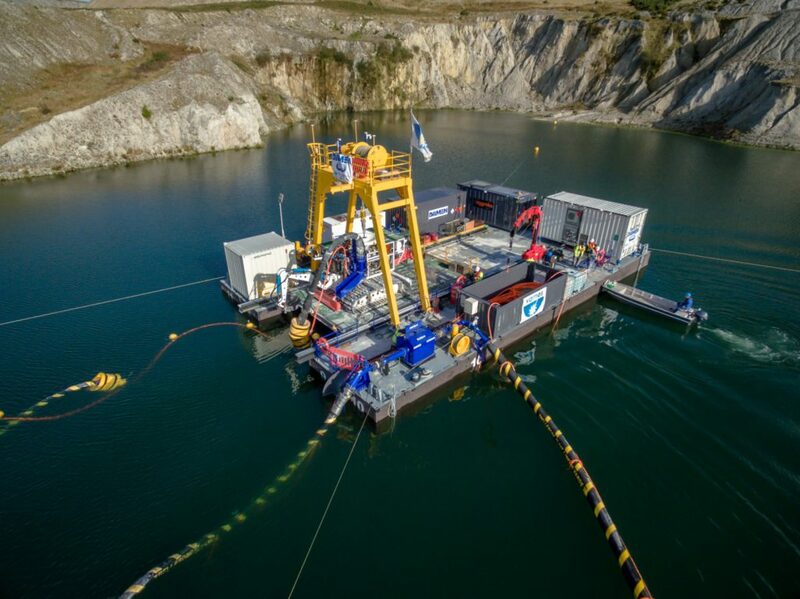 Although the requirement for the slurry circuit on the MV are deceivingly similar to a normal dredge system, there is one fundamental difference in character: vertical transport. At the system architecture phase we assumed a dredging depth of at least 100 m. For clean water, this poses not so much of a problem, once pumping mixture is where the geodetical height difference comes into play. 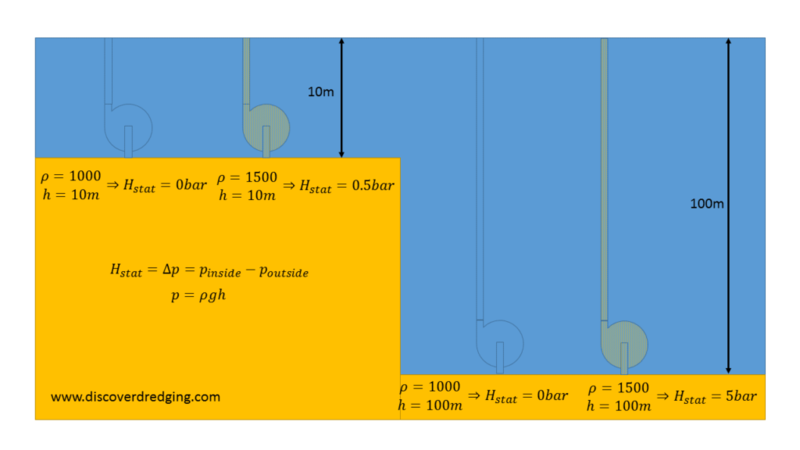 At 100 m a 1500 kg/m³ mixture requires an additional 5 bar of static head. The dredge pump has to cope with the large variation in head requirements. For the prototype machine, the only option is to vary the dredge pump speed. Still at a normal operating condition, we expected a head requirement for 10 to 16 bar. This is why we developed a dual stage dredge pump, it delivers double the head of a normal dredge pump. The variation of the pump speed has been accomplished by various controllers working together. The power is generated on the LARV by a diesel engine driving a generator. A frequency drive supplies a hydraulic power pack on the MV. The power pack has a variable displacement pump for controlling the flow. At the dredge pump side there is also a variable displacement motor. With this setup in place, the dredge pump can vary between a slurry circuit just filled up with clean water and a fully filled riser with heavy mixture at the operating point. On top of that, there will always be the possibility, that the density increases even more. The flow will reduce and so will the power consumption. This enables the drive to increase the speed for extra oompf of the dredge pump to clear the riser. Where normally the dredge pump speed is controlled by the pump swash plate, the motor swash plate is so to speak the turbo boost. This is similar to a constant power drive for normal dredges, but the vertical riser makes the problem more pronounced. So, not only the starting up of a dredge pump should be considered in the design of the drive train, but also the variations in operating point. Regarding the comments I received on my last post, yes indeed a production model of the ¡VAMOS! system would have an all-electric drive. Just be sure to have enough copper in the motor to cover every possible operating point.